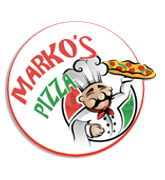 Online ordering menu for Marko’s Pizza. Come down to Marko's Pizza here in Baltimore. Our famous Strombolis are one thing. We know you've heard about them. Grab a bite of one of our Buffalo style pizzas. They are hot! Hot! Hot! Order online for carryout or delivery today! We are located on the corner of Hillen St and Forrest St, just a few minutes from Johns Hopkins Hospital and The Walters Art Museum.